"I created this so it's not too spicy, but is packed with flavor. My kids loved it! For variety, add corn or other vegetables or switch to other chopped tomato varieties (chiles, jalapenos, etc.). Follow the boiling method prior to baking if you don't want a crispy bell pepper. If you have small peppers, use more of them for this recipe. They taste great with a dollop of sour cream on top." Bring a large pot of water and 1 tablespoon salt to a boil; cook green bell peppers in the boiling water until slightly softened, 3 to 4 minutes. Drain. Heat olive oil in a skillet over medium heat; cook and stir onion in the hot oil until softened and transparent, 5 to 10 minutes. Mix rice, black beans, tomatoes, and cooked onion in a large bowl. Add chili powder, garlic salt, cumin, 1/2 teaspoon salt; stir until evenly mixed. Fold 1 1/2 cups Mexican cheese blend into rice mixture. Spoon rice mixture into each bell pepper; arrange peppers in 9x9-inch baking dish. Sprinkle peppers with remaining Mexican cheese blend. Bake in the preheated oven until cheese is melted and bubbling, about 30 minutes. 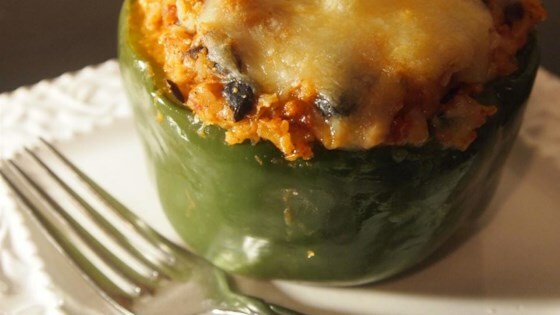 The classic stuffed bell pepper hot dish. I like to use Sargento® Authentic Mexican shredded cheese, which takes it over the top! The nutrition data for this recipe includes the full amount of sodium for the salt used in boiling the peppers. The actual amount of salt consumed will vary. The flavor was good but the stuffing came out a little dry. Next time I'll be adding a can of tomato soup and maybe some corn. I made this but added 3 cloves real garlic, hot chilies instead of green chilies. I used brown rice and pigeon peas. I used 2 tsp chili powder too. They were just fabulous! !